Any film that opens with Chris O’Dowd talking directly to the camera is starting on the right foot, his attitude and off-kilter humour are irresistible, especially when he makes hilarious classroom comparisons of TV’s “The Wire” to Shakespeare and Dickens. 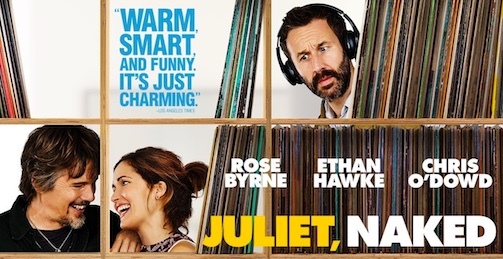 In “Juliet, Naked” he plays Duncan, a film studies teacher obsessed with a onetime singer/songwriter who has long since disappeared. His entire existence is given over to pretentious babbling about Tucker Crowe for a small but fanatical fan base online. After fifteen years, his girlfriend Annie (Rose Byrne) is at the end of her rope. She questions their relationship and her very existence in a boring seaside village where she runs a historical museum inherited from her father. One day she posts a response to one of Duncan’s essays about a long-lost demo recording by Crowe and receives a response from Tucker Crowe (Ethan Hawke) himself. He’s about to travel to the UK and wants to meet her, which is how and why the plot thickens. Based on a Nick Hornby novel, the film’s comedic elements run the gamut from subtle to broad, but the characters remain believable throughout. There is an unforced quality to the film that is very appealing: it’s fresh and original, and the cast simply couldn’t be better. Hawke even gets to sing and, as evidenced in the Chet Baker biopic “Born to be Blue,” he’s quite good. Tired of formula-driven films? Try “Juliet, Naked.